﻿Three types of pool Memberships are available. Memberships are renewed on an annual basis. Pool Memberships are intended only for the family members of the permanent household and do not include any person of a Member’s ‘extended’ family. All persons who are not Members are considered Guests. Senior Memberships are only for those households where all family members of the permanent household are aged 55 or older (limit 2 seniors per household). • Guest Fees: Adults $5.00/day Children & Teens (under 18) $3.00/day. Must be accompanied by a member. 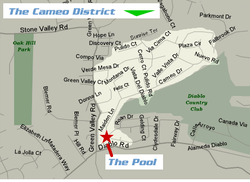 The following streets define the Green Valley Recreation and Park District (“Cameo” area). If you do not live on one of these streets you are considered to live outside the District: Bountiful Court, Montana Drive, Pulido Road, Cameo Drive, Nob Hill Place, Valle Verde Court, Cerro Court, Nuevo Road, Valle Vista, Club Terrace Court, Plaza Court, Verde Mesa, Feliz Court, Plaza Circle, Via Cima, Maiden Lane, Pulido Court, Vista del Diablo, and East side of Green Valley Road from Diablo Rd to Verde Mesa. 2.Print, sign, and mail in the Release and Assumption of Risk form and the Pool Rules form. District Priority: First priority is given to families that reside within the Cameo area and were Members the previous season. Membership Priority: Second priority is given to families who reside outside of the Cameo area who were Members the previous season, and Cameo area residents who were not Members the previous season. Open Priority: Third priority is given to families who live outside the Cameo area and were not Members the previous season.